The other night I came home from work (you didn’t think that I spent all day writing recipes and posting them on the site for you, did you?) 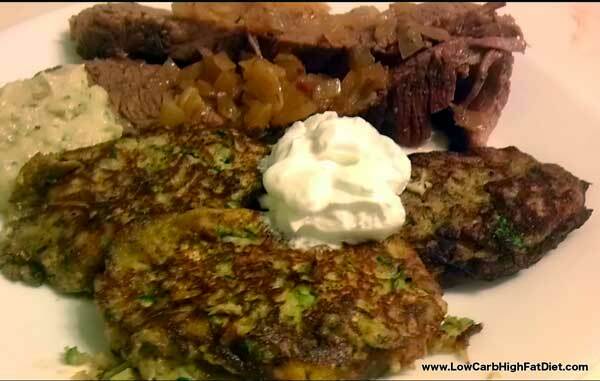 and my wonderful husband had made me a beef brisket with zucchini latkes. 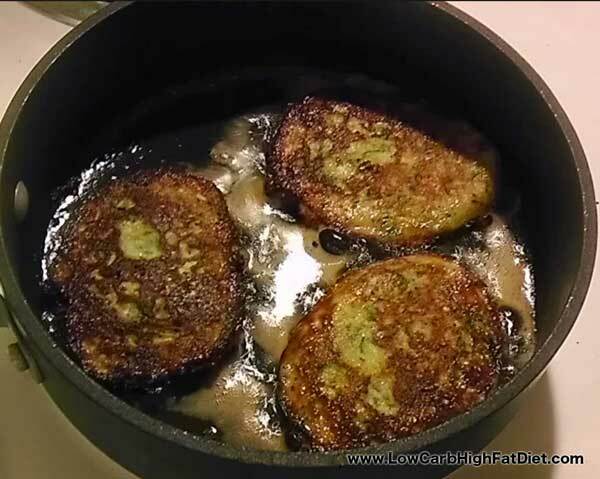 Latkes are pan fried vegetable pancakes that harken back to my family’s Eastern European roots. They’re usually made with starchy root vegetables such as potatoes. They have a stick to your ribs goodness, and make a side dish worthy of any happy family meal. This is the sort of recipe that takes me back to my childhood. One of my favorite holiday meals around the end-of-the-year was always roast beef, which we called grandma’s roast, accompanied with the traditional crispy, salty, fatty taste of latkes. In my family, latkes were always served with sour cream, but we never accompanied them with the applesauce that a lot of other families included. For us, it was about the savory deliciousness of the latkes, and the rare treat that was real sour cream. Of course in the ensuing years, we’ve learned sour cream was actually probably the healthiest part of that side dish. It was the potatoes in the latkes, and not the fat, that made them so unhealthy. But potatoes also contributed to the delicious crispiness. There’s almost nothing that can absorb fat and crisp up like the starchy texture of the potato. Fortunately, a number of people have discovered that there are some excellent alternatives to potato. Properly treated, a lot of vegetables can be used to make very serviceable latkes. One of my favorites is the zucchini. 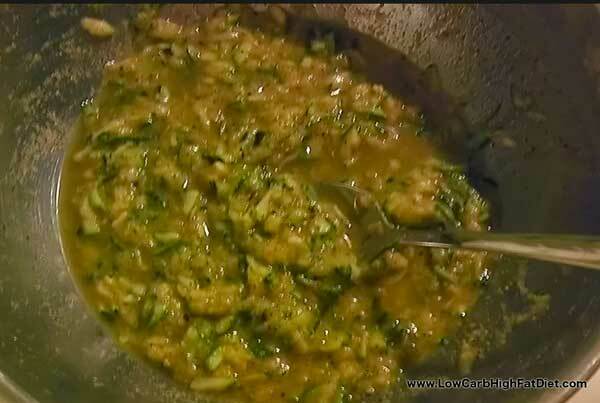 It has a light texture and an ambiguous flavor that lends itself well to fried dishes. It doesn’t have the starchiness of the potato, so you do have to treat it with a little bit of extra care in order to get the effect that you want. But properly shredded and drained, the zucchini can make some of the best latkes you’ve ever tasted. I won’t say that you will never be able to tell them from potato latkes, but they could become a new favorite. To make the zucchini latkes, my husband started with two eggs and two zucchinis, about medium-size. He shredded the zucchini and squeezed it in a cloth to get out all of the extra liquid. Then he scrambled the egg, and mixed the two together with a little bit of salt, pepper, and onion powder. To give them extra little bit more bulk, he added in two tablespoons of coconut flour. Let me pause a minute to sing the praises of coconut flour for fried foods. In this recipe, coconut flour replaces the matzo meal that’s normally used to thicken potato latke batter. Coconut flour has some wonderful properties, including the ability to absorb liquids and create a thick, pasty texture. While this may make it a little bit more complicated use for baking, it makes an excellent complement for frying. It’s especially good recipes like this, where it serves to thicken and hold together a better. Being the arch anti-traditionalist that he is, my husband chose to fry the latkes in bacon grease. Now latkes are usually fried in chicken schmaltz. This is fat derived by rendering chicken skin with onion, and it’s also very delicious. But we have a lot of bacon grease around the house, because we eat a lot of bacon, it produces a lot of grease, and the grease has wonderful properties as a ingredient for frying. Using bacon grease surprisingly didn’t add a lot of smoky flavor to the latkes, even though he used a lot of bacon grease, but it did contribute to the even browning, and the delicate crispy texture of the edges. He fried the latkes in batches of only three or four at a time at medium to high heat, making sure that the edges didn’t touch in the pan. He used ample bacon grease, so that each latke was practically half submerged in a pool of bacon grease all its own throughout the cooking process. And he was liberal about adding additional bacon grease as the latkes absorbed the delicious healthy saturated fat. Cooking latkes correctly is an art form. It’s important to get the batter thick enough that it spreads into a layer no more than about an a quarter of an inch thick. Any thicker than that, and you get a mushy center that you don’t really appreciate when you’re actually eating your latke. With zucchini latkes, it’s particularly important not to let them get too thick, because that mushy center won’t hold its shape as well as a potato latke might. He watched the latkes carefully as they fried, waiting for the edges to turn brown before flipping them. If the edges haven’t started to brown, you can be certain that the bottom of the latke is not properly cooked. The idea is that you want the bottom of the latke to have a solid brown texture, so that it will hold its shape when you flip it to brown the other side. The coconut flour in this recipe makes it much easier to flip than another zucchini latke recipes. Once fried for about 2 to 3 minutes on each side, the latkes can be transferred to a tray lined with paper towels, to absorb a little bit of the extra grease. This isn’t because the extra grease is bad for you, but if you leave it on the latkes they will get mushy while you’re waiting to eat them. After they’ve drained, latkes can be kept in single or double layers on a baking pan, and heated up crisp at the last minute in the oven. I was surprised to learn that this worked, but the result is surprisingly good. He served my latkes with a generous dollop of sour cream on top, as a side dish to a delicious roasted brisket. I’ll give you his brisket recipe later, if he allows it. He’s very particular about some of his recipes, but he’s such a master when it comes to roasting meat, it would be a shame not to share it with the world. 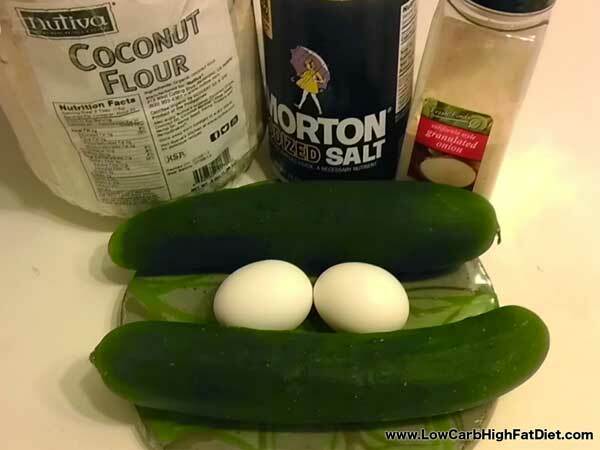 So the next time you have family coming over for a big dinner, try making some zucchini latkes. They may not be exactly what everybody’s expecting, but I guarantee you nobody will be disappointed. Thanks for the recipe .. but coconut flour is not listed in the ingredients. How much do you use? How embarrassing! After I go on and on about how wonderful coconut flour is in a recipe like this, I forgot to include it in the original recipe! I use one tablespoon for a batch this size. A little goes a loooong way with coconut flour. Thanks for catching that, Linda!